Balljoint-to-Steering Knuckle Nut 109-149 ft. lbs. Hub and Bearing Retaining Nut 221-295 ft. lbs. Lower Control Arm Pivot Bolts/Nuts 141-191 ft. lbs. Stabilizer Bar Bracket Nuts 44-59 ft. lbs. Link Nuts 132-192 in. lbs. Strut-to-Steering Knuckle Bolts/Nuts 141-191 ft. lbs. Strut-to-Vehicle Bolts and Nuts 25-34 ft. lbs. Axle Damper-to-Axle Bolt/Nut 57-75 ft. lbs. Axle Damper-to-Vehicle Nut 57-75 ft. lbs. Lower Arm-to-Axle Bolt/Nut 71-97 ft. lbs. Lower Arm-to-Frame Bolt/Nut 71-97 ft. lbs. Shock Absorber-to-Axle Bolt/Nut 57-75 ft. lbs. Shock Absorber-to-Vehicle Nut 25-34 ft. lbs. Stabilizer Bar-to-Lower Arm Bolts 29-37 ft. lbs. Upper Arm-to-Frame Bolt/Nut 71-97 ft. lbs. Upper Arm-to-Axle Bolt/Nut 71-97 ft. lbs. Airbag Module Retaining Bolts 35-53 in. lbs. Steering Gear-to-Crossmember Bolts 90-99 ft. lbs. Steering Shaft-to-Steering gear U-joint Pinch Bolt 30-40 ft. lbs. Steering Wheel Retaining Bolt 22-33 ft. lbs. Tie-rod End-to-Steering Knuckle Nut 35-47 ft. lbs. Warning: The models covered by this section are equipped with airbags. Always disconnect the negative battery cable, then the positive battery cable and wait two minutes before working in the vicinity of the impact sensors, steering column or instrument panel to avoid the possibility of accidental deployment of the airbag, which could cause personal injury. Do not use electrical test equipment on any of the airbag system wiring or tamper with them in any way. The steering column must not be rotated while the steering wheel is removed; to do so could damage the airbag contact assembly. Fig. 1 Front suspension and steering components. Fig. 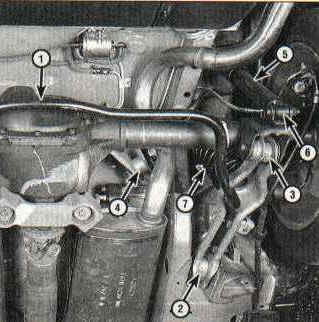 2 Rear suspension components.